It’s been a couple of weeks since my last post, the delay being due to a weeks holiday in Brittany, France. I had hoped to write a post towards the end of the week about my running experiences, but an unfortunate accident sidelined any plans for the last few days. After a sunny afternoon on a small beach, a relative cooked dinner for us all on a portable bbq. Afterwards, he attempted to safely dispose of the hot coals by digging a hole in the sand and tipping the bbq contents in. Unfortunately he stepped on the super hot sand the bbq had occupied. After 25 minutes with his blistered foot cooling in the sea, the ambulance took him to hospital, where they had to remove the entire skin from his sole, as the hot sand had embedded in. Four days later he was allowed out hospital, but it will take weeks to heal. As a runner I appreciate my feet, and as a barefoot runner I especially appreciate my soles. As a non runner, my relative…. treasures his soles just as much. I wish him a speedy recovery. Back to my original post subject though. We holidayed in the same area last Easter, when I was starting out in vibram fivefingers. Last year I returned with tendonitis from a few 6 mile runs. My first holiday run this year was a 13 mile barefoot run, during which it struck me how far I have progressed. This run included 5 miles along a flat beach, perfect for running, shod or otherwise. But there were no runners! In fact I hardly saw anyone running all week. Five runners tops. I see more than that on an evening run back home. What I also struggled to see were ‘large’ people. Young and old were between average or slim, and it was refreshing to see. But this seriously hit home on our first service station stop in England, where the opposite held true. The bars show the percentage of adult population with a BMI greater than 30, ie obese. USA tops the table at 33.8%, with the UK in 7th with 23%. France is towards the bottom of this list with 11.2%, roughly half that of the UK. So how come I saw so few runners in France but the obese percentage is half that of the UK’s? Our holiday location was very rural, but the nearest city, Lannion, had very few fast food ‘restaurants’ or take-aways. My home, Market Harborough, has a huge choice for a small town. Could this point to a cause? Maybe, but I’m sure there are many more reasons beyond my understanding. 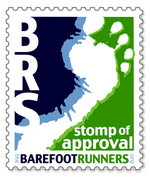 This entry was posted in Barefoot, Health, Running by Bob. Bookmark the permalink.